In at least two recent stories, Greenwich is becoming a Royal Borough in early February. 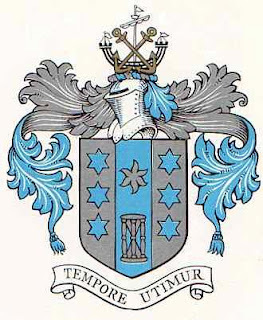 They’re planning a whole lot of stuff to help celebrate, but they’re also getting an update of their coat of arms from the College of Arms in London. The upcoming celebrations and the “upgrade” to Royal Borough status are part of the Queen’s Diamond Jubilee, as noted in news stories in the News Shopper (January 8, 2012, at http://www.newsshopper.co.uk/news/top_stories/9459245.Royal_borough_to_be_Greenwich_unveils_designation_celebrations/) and Wharf.co.uk (January 6, 2012, at http://www.wharf.co.uk/2012/01/greenwich-to-become-royal-boro-1.html). 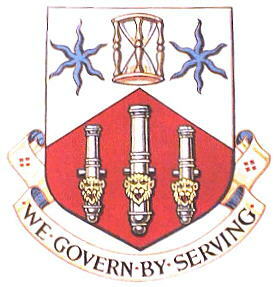 I haven’t seen any specific details yet about how the borough’s arms are going to be changed, except that the arms “will be based on Greenwich's existing coat of arms, to which will be added new heraldic features available only to boroughs with Royal status. These include the Tudor Rose” (according to the story in the Wharf). with a nearly complete (retaining the hourglass and estoile only) redesign done in 1965. Their current arms are pretty busy. I hope that the College of Arms is going to simplify them a bit before adding more stuff to them (e.g., a Tudor rose).